Vincent Scala’s Frozen Blue Lucky Cat! The weather is getting a little frosty at the minute here in the UK. A little frozen shall we say! We don’t like it. 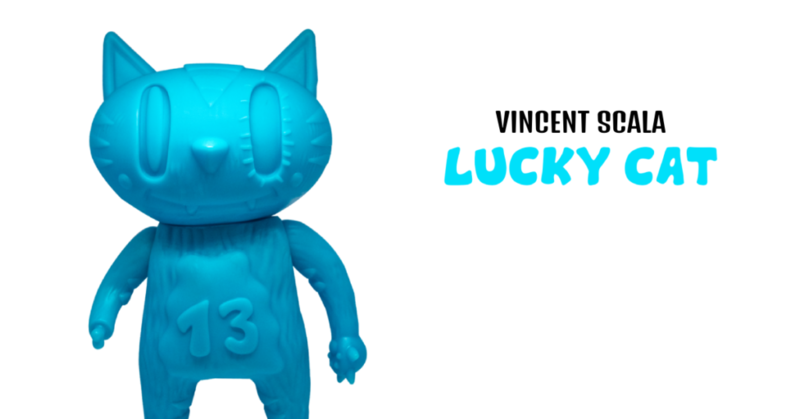 What we do like, however, is the new Frozen Blue colourway of Lucky Cat by Vincent Scala! This vinyl cutesy was released at DesignerCon last week and is now ready for an online release! Available right now to purchase from Vincent’s online store for $50. HOWEVER, if you purchase within the next 24hours or so and use CYBER code you can get 40% off. A whopping $20! You can also use CYBER to get 40% off EVERYTHING in Vincent’s store too! Go wild! You deserve it. Vincent’s online store can be located HERE. There are four colourways of Lucky Cat, meaning you can save $80 if you buy all four today/tomorrow! You can also locate Vincent on Instagram HERE. Oh yeah, Frozen Blue Lucky Cat is limited to only 13 pieces, so don’t hang around!